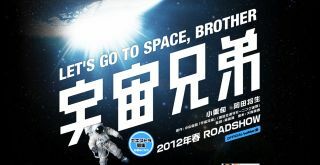 The 2012 Japanese science fiction film "Space Brothers: Let's Go to Space" will open in 2012 and tells the story of two brothers who dream to be astronauts, one of whom makes it. The movie is a live-action version of a Japanese manga comic series. CAPE CANAVERAL, Fla. — A Japanese film crew will be at Kennedy Space Center and other Space Coast locales in June to film scenes for a full-length action movie that already is drawing buzz in Asia. "Space Brothers" will put a popular manga series of comic books on film for the first time. The Japanese crew was in Brevard County in February and April, scouting out locations and doing secondary filming. They will be back in June to film with the stars of "Space Brothers" and a group of local acting extras. "It’s been great," said Yoshi Hosoya, who is the U.S.-based producer for the project. "People have been very helpful." Jim Lewis, president of Cape Canaveral-based Communications Concepts Inc., the local production company helping coordinate work on the film, said the film plot for "Space Brothers: Let's Go to Space, Brother" is based loosely on several of the dozen "Space Brothers" books that have been published. The comic book characters have spun off action figures and other collectibles. He said manga is much more popular in Japan than U.S.-produced comic books are in the United States, and is the basis for many Japanese movies and television shows. It is particularly popular in the 18-24 age group. The "Space Brothers" film will be produced and distributed by Toho Studios, among the largest film companies in Japan, and perhaps best-known in the United States for its series of Godzilla movies. Toho said it beat out more than 20 other movie studios and television stations for the project. Hosoya said the 1½- to 2-hour film will include 15 to 20 minutes of scenes shot in Brevard County. Lewis said other filming is being done in Japan, both on location and in a studio. Lewis credits Space Coast Film Commissioner Bonnie King with helping capture the project for the area. It will qualify for special state tax incentives for filmmakers producing movies in Florida, including bonus incentives because "Space Brothers" is a family-friendly film, Lewis said. Release in Japan is expected next spring.